Northwestern College isn’t just my alma mater. My soul is entwined with this school, this campus on the lake. I grew up down the road, and over the years, this place grew as familiar and comfortable to me as my own bedroom. It started when I first visited the campus, at age 10. My parents took me to see the drama department’s world premiere of “The Dawn Treader.” They knew I practically inhabited Narnia, and guessed, rightly, that I would be beside myself to see one of the Chronicles told on stage. They laughed the knowing laugh of parents. What does a 10-year-old know about college, especially after her only exposure to this one had been a stage bursting with a giant ship and actors dressed as valiant mice and greedy dragons? On that account, they were right. I knew nothing of college, and I had no scope to make such a grand decision. But something in me knew instinctively that love at first sight isn’t always a fluke. My decision stuck. 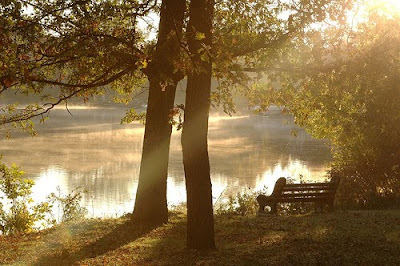 That night, I left a little bit of my soul along the shores of Lake Johanna. I left another piece when our church did church on campus while our church was being built. (Too many churches? Sorry. Curse of the pastor's kid.) For more than a year, I sang hymns while balancing on the spring-loaded chairs in Maranatha Hall and I learned how dangerous it was to drop a crayon at the top of the theater incline. I splashed in the fountain outside with the other pastor’s kids when our parents talked too long. I went to Sunday school in the college cafeteria, tucked in a booth that was tucked in a niche that used to be a confessional. 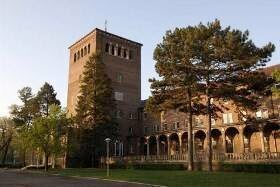 (The campus had originally housed a Catholic seminary.) The spit wads I traded with my friends when our long-suffering teacher got long-winded are probably still embedded in the brick walls. When I was a freshmen in high school, I successfully auditioned for the college fall musical, on a recommendation from my English teacher, whose husband was artist-in-residence at Northwestern. The musical was “Fiddler on the Roof.” I was nothing more than a chorus member and dancer, a village girl – or in one scene, a village boy, since only men are allowed to dance the famous bottle dance. Evening choral practices, afternoon dance class, two long weeks of dress rehearsals, a real dressing room and college kids who were kind to me – it was heady. And so I came full circle. I was in every fall musical after that, through the rest of my high school years. The King and I. Oliver. Once, a spring drama based on the life of Joseph. I made friends and nourished crushes and developed a taste for campus life. Maybe no surprise, my first job was at Northwestern. I worked in the Blue Room, a banquet and wedding reception hall, that is next to the stunning chapel (left) where hundreds of couples get married each year. I wore a 100% polyester black dress and a white apron and white collar and served the Blue Room’s famous ice cream punch to countless wedding guests. At Christmas, I would serve thickly frosted yule kaka to people coming to see the annual Gamble Family Christmas. It was a good job, an entrance into the world of waitressing, with an endless supply of free plum chicken. Most of my youth group leaders were either students or alums of Northwestern. Our youth pastor himself was even a part-time employee; he was waterfront director, which is no small thing for a campus that is surrounded on three sides by water. My fondest summer memories root in the campus beach, on the island connected to the mainland by a rickety bridge. My closest friends and I built a sand volleyball court, raked Canada goose poop, swam to the floating dock, called Pepsi and Reese’s a balanced lunch. We never got the hang of windsurfing, despite out countless tries. Instead, we fashioned them into crude, first-generation wake boards. We would stand on top, hang on to the tow rope and yell “Hit it” to whoever was behind the wheel of the competition ski boat that belonged to our youth pastor. We tanned easily, laughed often and had no clue that our lives were near idyllic. I say all of this so you’ll understand why I went to chapel twice last week, with Kieran and Teyla in tow, to pray for and with the student body as Shaun Groves spoke and sang and asked them to consider what is enough. I couldn’t stay away and let Shaun come to my home without being there to welcome him, to petition our great God to do a work in the hearts and souls of my extended family. Shaun spoke a powerful word, as those of you familiar with him would expect. He challenged the students to make sure they aren’t hoarding their manna, to consider sponsoring a child through Compassion and do what the church was intended to do. He told the story of Kiran and her indefatigable joy – the same morning Melissa posted this, ironically -- and once again, I was struck with the happiness of a girl who has nothing but Jesus. I pray she is just as happy today, just as blessed. And Shaun being Shaun, he made a few quips about our cold weather and how he’s pretty sure the Hebrew words for manna and quail translate more correctly as chicken and biscuits in modern vernacular. I’m told he also covered Justin Bieber at the Thursday evening coffeehouse venue, but as I was putting babies to bed at the time, I can’t say that with certainty. Before he left, Shaun and his cohorts painted The Rock, a longstanding Northwestern tradition. Fifty Compassion kids were sponsored by Northwestern students, which makes my soul smile. Those students are signing up to receive a gift, even if they don’t know it yet. I received a gift as well. Spending time on campus with my two little ones, watching them walk into my most cherished memories, was a treasure. Even more, being there while Shaun spoke, praying in the wings, interacting with the students. It fed me, in a way I can’t quite explain. It made me feel like I wasn't just a Northwestern alumnus or a stay-at-home Mom. For a few hours, I was in the thick of it. Past and present and future merged. There’s something about coming home that does that, I guess. And Teyla? She got a gift too – in addition to the bag of caramel corn we bought at the just opened and gorgeous Billy Graham Community Life Commons. Meet Sadi, our newest Compassion child. Because the only thing sweeter than going home is the family awaiting you there. Teyla had just fallen asleep, when I heard the wails. Connor, in his room on the other side of the house, was sobbing. I slid out of Teyla’s bed, set down the laptop and, on tiptoe, ran down the stairs toward the sounds of distress. Had he fallen off his bunk? Did he cut himself with a forbidden object? Did he clunk his head on the ceiling? Connor is so into his Dad lately. He doesn’t just love him. He needs him. He inhales his Dad’s attention like a person drowning. And maybe he is, a little. All this travel, it wears on us. Boys need their daddies. I know it doesn’t always work that way in our world. Daddies travel, daddies get busy, daddies leave. But I believe that is wrong, with every fiber of my being. Dads are crucial. They are important. They are needed as much as oxygen, maybe more. Eventually, Connor stopped crying. He wiped away his tears with the back of his hand and sniffed a few times. He gave me a picture he had drawn for Corey, an orphan who has grown into one of the best dads I know. And then Connor turned to me, with markers in hand. Little boys need their mommies too. Three of my four children are sprawled out on my floor, giggling and whispering. Their sleeping bags swish a lullaby. I wouldn’t normally allow a sleepover in Mom’s room on a school night. But when we first tried this a month ago, the whole thing went so well – the kids read books to each other, played quietly, then slowly fell asleep, one by one – that I couldn’t resist trying it again. Especially since we are in the midst of a busy travel season for my husband. Bedtime is most exhausting time of day when I’m the only responder to every cry for water, every plea for one more bedside prayer, every whimpered request for extra cuddling. It often takes me two hours to get everyone bathed, jammied, brushed and asleep in bed. But not tonight. Instead, the candles I lit on the fireplace mantle flicker a nostalgic warmth, and the children sleep peacefully at my feet. Is this what the Ingalls used to feel, when their whole family slept in the same room next to the fire, with Pa’s gun safely tucked above the door? I don’t really know why we Americans put everyone in their own space. I would be fine sleeping like this forever. Or at least until someone wakes up crying and causes a chain reaction of early morning distress. Then they can sleep in their own rooms. 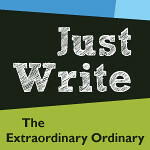 This post is brought to you by Just Write, a new Tuesday exercise in writing without overthinking at The Extraordinary Ordinary. Play along -- and let me know so I can come visit you too. I summon the energy to throw the last load of wet laundry into the dryer when I see Luke, Connor’s Jedi Build-A-Bear, sitting on the counter. Luke is waiting for me. Seems he’s coming apart at the seams (welcome to the club, Luke) and I’ve put off fixing him all day, even though Connor asked me every other hour if Luke was repaired yet. “I haven’t done it yet, buddy,” I would half smile, half sigh. “Dad is on a trip this week, so I’m doing everything myself. I still have to make dinner, fold the laundry, give the baby a bath, clean up the baby oil Teyla spilled in the bedroom….” And the list would go on and on and on. Eventually, Connor would lose interest and return to Lego Universe or battling his guys or pestering his sister. Outwardly, I kept putting out fires. Wipe the counter, pick up toys, pack the lunch. But inwardly, my soul wept. The hardest thing about parenting four kids is that I rarely get a chance to just focus on one child. I am constantly disappointing someone, cutting a conversation short, begging the older kids to wait a minute so I can insert-task-here, telling Teyla I can read to her after Kieran is asleep, saying I can watch Connor play his video game after I finish washing the dishes. To some degree, it’s necessary. This is life on planet earth. We dwell in time. I can only spin so many plates at once. But it hurts my heart. Being a SAHM, I am with my children all day. But it is always as a group. I am rarely with them one on one. I miss them as individuals. I put the wet towels into the dryer and think back to bedtime prayers with Connor just a few minutes earlier. Bedtime is one of the only built-in times each day when I might get a few moments alone with each child. Connor always has stories to tell me about the Lego guys he keeps scattered across his bed. (Some people read before bed. Connor battles Legos. Whatever works, right?) His big brown eyes are lined with the eyelashes so long and so dark, they seem almost wasted on a boy. He is earnestly intent on telling me about the bazooka he put on the back of this spaceship so he can get that guy in the green shirt on that spaceship that he doesn’t even notice that I’m not watching the Legos. I’m watching him and wondering how the baby boy who used to read Sandra Boynton with me each night is now a seven-year-old with two missing teeth who is sitting cross-legged on his bunk bed. I push the start button on the dryer and turn to pick up Luke and find my sewing kit. It’s late. I’m tired. I can only do so much. But maybe a little needle and thread will tell Connor I love him even when I have to decline a game of kickball in favor of changing a diaper. Fall arrived last night, on the wings of a wind strong enough to pull our patio umbrella out of the stand. Today, it's 60 and cloud-scrubbed skies and the ground is already littered with dead leaves. I am not ready for winter. Not. Ready. But it's impossible to do anything but sigh with delight when fall knocks on your door. Kieran fell asleep on the way home from Trader Joe's, and he's still there, head bent low. Teyla is riding her Big Wheel in the driveway, so proud that her legs are finally long enough to reach the peddles. "Cruisin' fun!" says the Big Wheel, and Teyla says, "Mama, look at me! I can turn!" And then she jumps off the bike and runs into the garage and says, cocky, "I want a different bike. Come on, Mom! Are you listening to me?" The dappled sunlight falls on my keyboard, and the wind whispers in the limbs of the ash tree covering my head. My groceries are defrosting where I left them in the mudroom, and I'm hungry and we all need lunch and there is laundry to do and appointments to schedule and the list never ends. But right now? I'm going to sit in the shade and listen to the birds sing a farewell song to summer and watch my daughter ride her bike and grow a little older. It's so easy to lose the moments in the minutia. I wrote this - with a mixture of glee and guilt -- for my friend Heather's new Tuesday link-up called Just Write. If you are playing alone with Heather, will you puh-leeze let me know by leaving me a comment here? I want to stop by your place and read what you wrote. My head feels stuffed with a mixture of lead and cotton, and my nose is rubbed raw. How can one day of a cold – a September cold, no less – do this much damage? Can I stream of conscious tonight? Because it’s all I have energy for. I love reading other people’s blogs. But I’ve slowly discovered that reading other writer’s witty or thoughtful or meaningful thoughts silence my own. I read blogs for fun. But I lose my words in the process. Maybe I need to limit my time online and spend more time writing? But what do I do when I run into nights like tonight, when I’m too tired to put away the melting ice cream, much less compose a coherent sentence? Do I just go to bed and pray God’s rest reinvigorates me tomorrow? Does the reading itself amuse me to dull silence? I struggle with self-discipline. I long for the control to obey my soul and not my body. Maybe I should get up and put away the ice cream and turn off the computer and take a book and a blanket to bed and attempt to clear at least one nostril so I can breathe while I sleep. My body says no. Sit. My soul says yes. Move. My soul will win this one. Today is back to school for my two oldest children. Summer’s end is always bittersweet, but they are ready. I am ready. And in a move that is classic Minnesota, even the weather is ready. Our lows this week are in the 40s, our daytime highs are in the mid-70s and it’s nothing but blue skies and sunshine as far as the eye can see. Because I’m a mom, this morning I made Natalie and Connor stand in back-to-school finery (read: random t-shirts because hey, it isn’t school picture day yet) outside their classroom and smile for the camera. Natalie obliged, because she’s the responsible oldest and a girl. Connor? He didn’t oblige. Because he’s second born and a boy. Pictures on the first morning of school are one of those classic, almost cliché parenting moments. The photos themselves aren’t that great – often grainy due to fluorescents overhead and blurry due to the crazy surrounding us. But they are necessary, because they aren’t just pictures. They are signposts that mark the passage of time. First grade. Second grade. Third grade. Fourth grade. Even, Lord help me, fifth grade. Here in Minnesota, school never begins until Labor Day ends. (It’s state law. For real.) But I know many of you sent your kids off weeks ago. I know because I’ve seen the first morning of school pictures on Facebook, on Twitter, on blogs. I’ve seen happy grade schoolers, annoyed middle schoolers, cocky high schoolers. I’ve seen moms who looked relieved that school is beginning again and I’ve seen moms head for their back-to-school mimosa party as soon as the bus departs and I’ve seen moms that couldn’t hold back the tears. No matter the particular, the mom camaraderie compels me to look at those pictures, every one of them. Because I know underneath the new backpacks and shy smiles are the very heartbeats of the women I call friends. This growing up thing – it’s wild and exhilarating and completely out of our control. It’s easy for day to day life to obscure the truth – our children are growing up. School pictures force us to take stock of reality. And quite often, reality is a punch in the gut. To see my kids through the lens of my camera, they look so grown up. (Fifth grade! Natalie's last year in the elementary wing!) In my heart, they don't look that old. They still look like preschoolers, excited to go to the library story time and then grocery shopping with me. Good thing I still have two at home.